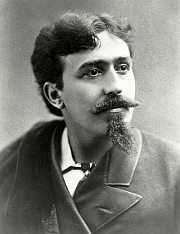 (1854-1918) Giuseppe Cadenasso was born in the small village of Maragolla near Genoa, Italy on Jan. 2, 1854. At age nine he sailed from Genoa to northern California where his uncle owned a vineyard. As a young man he found employment in San Francisco as a barber, waiter, and sang Italian opera at the Tivoli Opera House. His raw talent as an artist was discovered by Jules Tavernier. Tavernier took him to the studio of Joseph Harrington who gave him free art lessons. Cadenasso later earned enough money for further study under Arthur Mathews at the Mark Hopkins Institute. His studio-home on Russian Hill at 17 Macondray Lane was called “The Sign of the Eucalyptus.” He later moved across the bay where he painted scenes of the marshes and eucalyptus trees of Berkeley, Oakland, and Alameda. From 1902, Cadenasso was head of the art department at Mills College. Motivated by tone and harmony, Cadenasso developed an original style and often used his fingers to spread the colors. 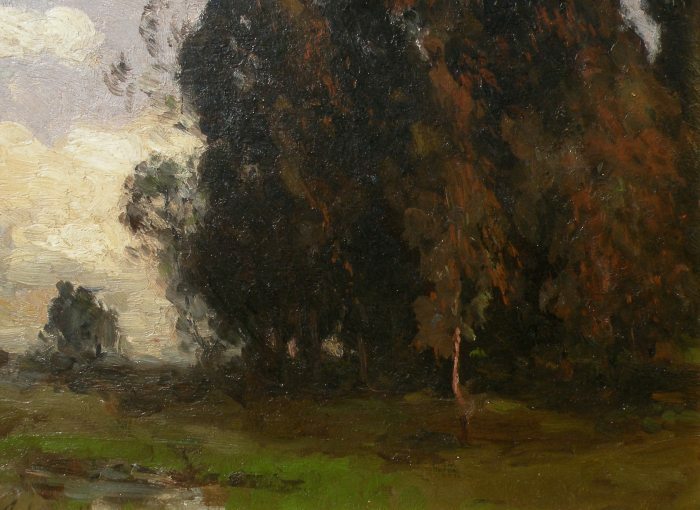 His lyrical landscapes earned him the title of “the Corot of California.” Returning home from seeing his son off to the World War, Cadenasso was struck by an automobile at Powell and Post Streets in San Francisco and died of injuries on Feb. 11, 1918. Works held: St. Mary’s College; Bohemian Club; Oakland Museum; Mills College; Nevada State Capitol; DeYoung Museum; California Historical Society. Exhibited: San Francisco Art Association; Bohemian Club; Mechanics' Institute; Alaska-Yukon Expo; Pan Pacific International Expo.